is associate professor in Classics and a fellow of Jesus College at the University of Oxford. His books include The Greeks and the New: Novelty in Ancient Greek Imagination and Experience (2011) and Music, Text, and Culture in Ancient Greece (2018), co-edited with Tom Phillips. His latest book is Socrates in Love: The Making of a Philosopher (2019). Sources from late antiquity, such as the 5th-century CE Christian writers Theodoret of Cyrrhus and Cyril of Alexandria, state that Socrates was, at least as a younger man, a lover of both sexes. They corroborate occasional glimpses of an earthy Socrates in Plato’s own writings, such as in the dialogue Charmides where Socrates claims to be intensely aroused by the sight of a young man’s bare chest. 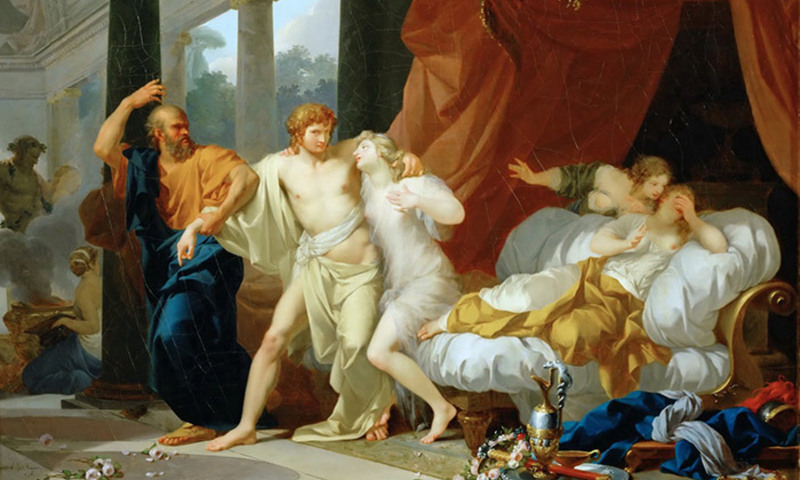 However, the only partner of Socrates whom Plato names is Xanthippe; but since she was carrying a baby in her arms when Socrates was aged 70, it is unlikely they met more than a decade or so earlier, when Socrates was already in his 50s. Plato’s failure to mention the earlier aristocratic wife Myrto might be an attempt to minimise any perception that Socrates came from a relatively wealthy background with connections to high-ranking members of his community; it was largely because Socrates was believed to be associated with the antidemocratic aristocrats who took power in Athens that he was put on trial and executed in 399 BCE.